You never know when injury will happen! Lend a helping hand to clients and employees with personalized first aid kits and custom printed bandages. Show recipients that, for your business, safety comes first! Upgrade yours and your clients' offices with branded bandages, full medical kits or bandage dispensers. Promote their use in the office, outdoor at company events, at home or in the car. Your clients will think of how helpful you are whenever an accident occurs! These promotional first aid kits are the perfect size for storing practically anywhere in case accidents happen. Be prepared for minor injuries with these customized first aid kits in an imprinted nylon pouch. A logo golf kit with the right tools and more. Large 48 piece promo first add kit packed in promotional case includes bandages, surgical pads and medical tape. 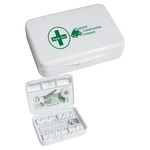 Basic promo first aid kit in a promotional case includes cold pack, bandages and antiseptic. Perfect for vacations, conferences, and trade shows this Recovery Custom Canvas Tote Kit w/ Carabiner has everything you need after a long night. Hang it on your bag to keep it near and handy! This convinient Color Bandage Custom Dispenser is the perfect size to keep in purses, backpacks, and briefcases. Choose from 15 dispenser colors and 5 bandage colors to match your branding. Safeguard against the competition with handy first aid bags. No matter where you or your clients work, every place of business needs a basic first aid kit on hand. If you want to make a great impression on professional, show them that you care about their well-being. ePromos' custom first aid kits are great for offices, classrooms, restaurants, and to use on-the-go. If the kits are already taken care of, we offer the option of kits with lanyards and other portable devices. These are ideal for people who love hiking, camping or other outdoor activities. When you're ready, request a sample or start customizing your first aid kits online today! You'll be on your way to building healthy business relationships in no time.